I have what is commonly called red-green color blindness. Last week my new Enchroma Colorblindness Correcting Sunglasses arrived and putting them on the first time was a breathtaking experience. Technically I have Deuteranomaly or green weakness which is an abnormality in the cones in my eyes that detect green light. This makes some colors appear less vibrant and makes distinguishing some colors more difficult. The Enchroma glasses only work outside in bright light, but in those conditions the difference is astonishing. Clouds are no longer just gray – there are subtle shades of blue, orange, teal and purple. Humans, including me, are a little disconcerting – light skinned or dark, we’re so much more salmon toned than I thought. 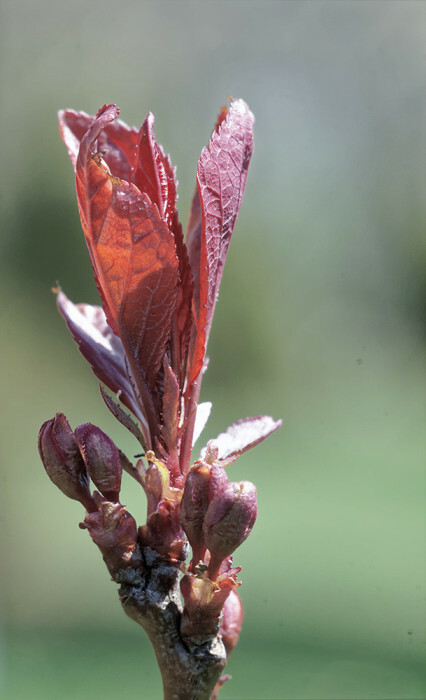 In an effort to convey the difference, I took a photo of emerging Plum tree leaves with the grass in the background. The luminosity and contrast of the two images is identical, only the color values have been mathematically adjusted to approximate a mild red green color blindness . The image on the left is how I see the leaves without the glasses and the image on the right is how I see them with the glasses. Use your mouse to click and drag the slider back and forth to see the difference.